Is it possible to clean a mysql innodb storage engine so it is not storing data from deleted tables? Or do I have to rebuild a fresh database every time? Here is a more complete answer with regard to InnoDB. It is a bit of a lengthy process, but can be worth the effort. Many people create multiple ibdata files hoping for better disk-space management and performance, however that belief is mistaken. Can I run OPTIMIZE TABLE ? You can however, segregate Table Data and Table Indexes from ibdata1 and manage them independently. Can I run OPTIMIZE TABLE with innodb_file_per_table ? Suppose you were to add innodb_file_per_table to /etc/my.cnf (my.ini). Can you then just run OPTIMIZE TABLE on all the InnoDB Tables? The .ibd will contain the Data Pages and Index Pages for that table. Great. Bad News : All you have done is extract the Data Pages and Index Pages of mydb.mytable from living in ibdata. The data dictionary entry for every table, including mydb.mytable, still remains in the data dictionary (See the Pictorial Representation of ibdata1). YOU CANNOT JUST SIMPLY DELETE ibdata1 AT THIS POINT !!! Please note that ibdata1 has not shrunk at all. (Sidenote: Whatever your set for innodb_buffer_pool_size, make sure innodb_log_file_size is 25% of innodb_buffer_pool_size. Delete ibdata* and ib_logfile*, Optionally, you can remove all folders in /var/lib/mysql, except /var/lib/mysql/mysql. Start MySQL (This will recreate ibdata1 [10MB by default] and ib_logfile0 and ib_logfile1 at 1G each). Now, ibdata1 will still grow but only contain table metadata because each InnoDB table will exist outside of ibdata1. ibdata1 will no longer contain InnoDB data and indexes for other tables. With the innodb_file_per_table option in /etc/my.cnf, you can run OPTIMIZE TABLE mydb.mytable and the file /var/lib/mysql/mydb/mytable.ibd will actually shrink. I have done this many times in my career as a MySQL DBA. In fact, the first time I did this, I shrank a 50GB ibdata1 file down to only 500MB! Give it a try. If you have further questions on this, just ask. Trust me; this will work in the short term as well as over the long haul. With regard to setting innodb_log_file_size to 25% of innodb_buffer_pool_size in Step 5, that's blanket rule is rather old school. Back on July 03, 2006, Percona had a nice article why to choose a proper innodb_log_file_size. Later, on Nov 21, 2008, Percona followed up with another article on how to calculate the proper size based on peak workload keeping one hour's worth of changes. I have since written posts in the DBA StackExchange about calculating the log size and where I referenced those two Percona articles. 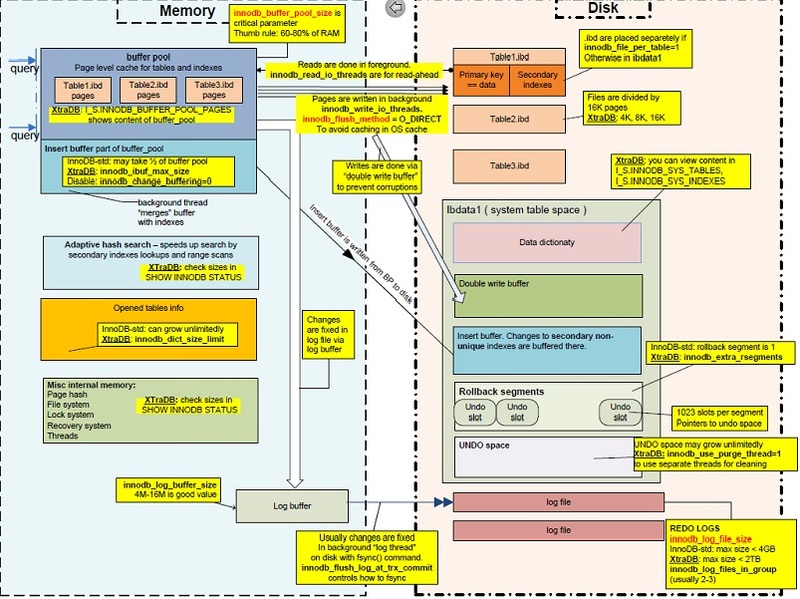 Jan 17, 2013 : MySQL 5.5 - Innodb - innodb_log_file_size higher than 4GB combined? Personally, I would still go with the 25% rule for an initial setup. Then, as the workload can more accurate be determined over time in production, you could resize the logs during a maintenance cycle in just minutes. The InnoDB engine does not store deleted data. As you insert and delete rows, unused space is left allocated within the InnoDB storage files. Over time, the overall space will not decrease, but over time the 'deleted and freed' space will be automatically reused by the DB server. You can further tune and manage the space used by the engine through an manual re-org of the tables. To do this, dump the data in the affected tables using mysqldump, drop the tables, restart the mysql service, and then recreate the tables from the dump files. Reclaiming disk space after dropping a database? How do I reduce MySQL's overhead as displayed in phpMyAdmin? At what point does MySQL INNODB fine tuning become a requirement?